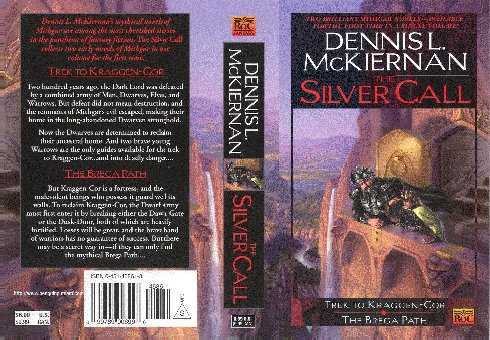 The Silver Call is the very first fantasy I ever wrote, and although it was my first, it was published after the second fantasy I wrote — The Iron Tower — but make no mistake, this truly is the first one written,[See footnote 1] and there is a special spot in my heart for The Silver Call for two primary reasons: 1) it kept me sane, for I was flat on my back in a cast that went from my armpits to over my toes, and it gave me something to do while recuperating, and, 2) it is the first story I wrote wherein Warrows appear. Why was I in that cast? What happened? I was run over by a car; it shattered my left femur, broke it into at least fifty pieces. One way to heal a bone break is to use a cast to immobilize the joint above the break and the joint below. For a femur, that means immobilizing the hip and the knee, and at the time the only way to do that was to go from armpits to toes with the cast. How did I get run over? While riding my dirt bike, a car came around a blind corner on my side of the road. QED. What about the Warrows? How did I come about them? Well, I knew that a Mithgarian adventure should include Elves and Dwarves and High Kings and brave warriors and Wizards and Rûcks and Trolls and Gargons and other beings fair and foul in a tale set in perilous times, for they are the stuff of high fantasy, and have been such going back to the days when stories were spoken and not written. For example, many an Irish and Norse and Celtic and other such tales tell of tall and fair Elves (e.g., the Sidhe), and doughty Dwarves (Germanic and Norse tales in particular), and monstrous Trolls and Goblins (Scandinavian folklore is replete with such), and High Kings and brave warriors and such. Yes, but what about wee folk? What about Warrows? Well, many of these oral tales featured wee folk too; for example, long before the white man came to the new world , my Cherokee ancestors told stories of wee folk, just as did my Irish ancestors in their own realm . . . and just as did many a tale teller in countries spread throughout six of the seven continents. But Elves and Dwarves and all the others — including the wee folk of legends and folk tales and fairy tales are usually people of power , — whereas I needed a folk of heart to be my surrogate, to be someone like me , someone with doubts and weaknesses and lack of lore, someone with whom the reader could identify, yet also be someone who could, when pressed, do whatever was needed in the defense of all he or she holds dear. Thus were born the Warrows of The Silver Call , someone like us who generally seem somewhat insignificant in the grand scheme of things, but who, when driven by circumstance and peril and need, will rise to the occasion, for, after all, desperate times do produce unexpected heroes. And you and I both know that that we ourselves on occasion can become heroes, and so we are indeed like the Warrows . . . with our weaknesses and naïveté and doubts and strengths . . . but most especially our heart . In many ways, we are also like hobbits and kender and other such wee folk, but unlike them, we Warrows can become quite deadly, quite lethal when pressed. Oh, don't take me wrong: as I said in the introduction to the omnibus edition of The Iron Tower , I love the wee folk of longstanding legend and of other authors' tales, especially the hobbits of J.R.R.Tolkien's magnificent saga, The Lord of the Rings ; and let me acknowledge here and now that a couple of things within both The Silver Call and The Iron Tower are written in homage, in tribute, to Tolkien . 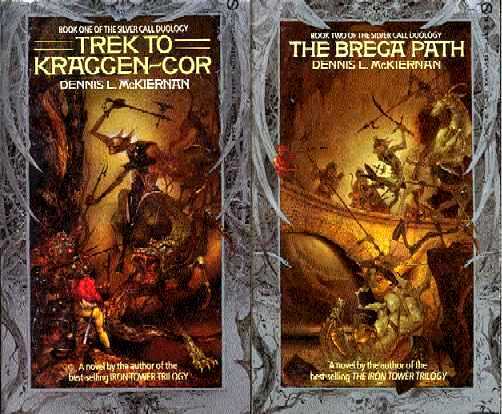 . . in particular, the titles of the opening chapters, as well as parts of the journey through the Dwarvenholt of Kraggen-cor, of Drimmendeeve, of the Black Hole. Wonderful tale tellers like Tolkien come along not once in a generation, but rather once in a lifetime, and then only if we are lucky. Fortunate are we that he set his story down in writing; fortunate are we also that his work lives on after he himself is gone. Like other authors, I can but pray that my own efforts will live on after me, though when I began I never expected such. Little did I know some twenty-odd years ago as I lay in a cast from my armpits to my toes that this very first tale of mine — The Silver Call — and the follow-on Mithgarian adventures would transform my life forever, would lead to a career change and to an age-spanning series. However, when I penned The Silver Call ,[See footnote 2] it was a place for me to escape being totally helpless, completely bedridden, when I was living, in effect, in a cement block. [See footnote 3] And escape I did, travelling across a wonderful place — even though quite perilous at times — and I am so glad to have journeyed therein. Glad, too, am I that so many of you — new readers and old alike — have chosen to travel across Mithgar at my side, though not in a "cement" block. A simple "thank you" doesn't seem nearly enough to express my gratitude for your company, yet it will have to do, for I can think of nothing else to say that would better convey my heartfelt appreciation. Let me also say that, just as I did with The Iron Tower , I wrote The Silver Call as a single story. It was my editor at the time (Pat LoBrutto) who decided The Silver Call should be a duology. And so it was done that way: two books to tell the tale. But you know, like The Iron Tower , I always felt that this story, too, should have been published as written — as a single book and not two. Well, here we are, whole at last, the omnibus edition of The Silver Call . And with this tale now in print as it was written, as it was meant to be read, let us all get comfortable in our favorite rooms, in our favorite chairs or lounges or beds, in whatever and wherever are our favorite places to read, and open the pages to the (oh-so-familiar, for some of us) opening words and experience all over again the tale for the very first time. Like many writers, I have learned a lot since penning this tale, and as a result I think I have become a better writer. Rather, when I penciled it, for in that cement block, all I could use to write the tale was pencils and tablets. By the way, I do not recommend getting run over by a car as a way to start a writing career. One Sunday afternoon (Memorial Day weekend of 1977) a car ran over me. I spent the next year or so either in traction, in casts, bedridden, in a wheelchair, on crutches. . . Lord! It's depressing just to think about it. When I was put in a hip spica cast, to stay sane I began working on the tale you are about to read — a different version, to be sure, yet still the same basic tale. When I finished it — when I actually wrote The End on the final page of that first draft — a great sense of achievement and elation coursed through every fiber of my being. Hey! I've done it! Then I began typing and revising it, and soon that second draft became the third or fourth. Ultimately I shipped the manuscript of The Silver Call to Doubleday. At that point I could have kicked back and waited for a response from them, but, flush with success, I was still itching to write. And the History outlined in The Silver Call was so intriguing that I just had to record it too. So I began The Iron Tower , a tale set in time 231 years prior to The Silver Call . I was well into this second novel when Pat LoBrutto, Science Fiction Editor at Doubleday, called and made an offer on The Silver Call . Faith! I was pleased and flattered; but then to his utter surprise: Pat, I said, Silver is great (modesty is not one of my stronger attributes), but Iron , the novel that I am working on now, should be published first. To make a long story short, Pat agreed to hold off until I finished The Iron Tower and he could look it over. Well, I finished, he looked, and it was published first. Now we come to The Silver Call , written first but published second: For more than one author, critics have been known to say, His second novel does not live up to the promise of his first. I wonder what they'll say about mine, since my first is actually my second…or conversely my second is my first. Almost no matter how you look at it, perhaps I will, or already have, lived up to my promise.